First isolated by Benjamin Schenck in 1898, sporotrichosis is a rare zoonotic (transmissible to humans and other animals) fungal infection of humans and animals. It is caused by the fungus Sporothrix schenckii which is present in soil, wood, living and decaying plant material. Infection occurs in a range of hosts which include humans where it is known as rose gardener’s disease. Outdoor workers such as farmers, forestry workers, gardeners, and nursery employees are at the highest risk. Dogs, camels, dolphins, horses, cattle, and pigs have also been infected. However, infection occurs most often in cats. Sporothrix schenckii is dimorphic, which means it exists in two forms. On vegetation, it forms mycelia, long thread-like filaments, while in tissue it converts to a yeast. It can survive for months or years in the environment. Sporotrichosis is most common in outdoor cats, especially males who are more prone to fighting. Cutaneous – Single fixed nodule or lesion which develops at the inoculation site. Multifocal or Disseminated Cutaneous – Lesions which involve two anatomic sites. Lymphocutaneous – Left untreated, cutaneous sporotrichosis can progress to lymphocutaneous. Nodules or lesions develop at the entry site, which then travels through the lymphatic system where new nodules and lesions develop along the lymphatic chain. Disseminated – Infection spreads throughout the body via the blood or direct inhalation and can affect any organ system, the lungs and liver are the most common sites, other locations include the bones (osteoarticular sporotrichosis), brain, joints, eyes, spleen, mammary gland, testis, and eye. Pulmonary – Infection of the lungs due to inhalation of infective spores. Sporothrix schenckii is found worldwide although clinical infection is most common in tropical and sub-tropical zones with humid climates which favour the growth of the organism. 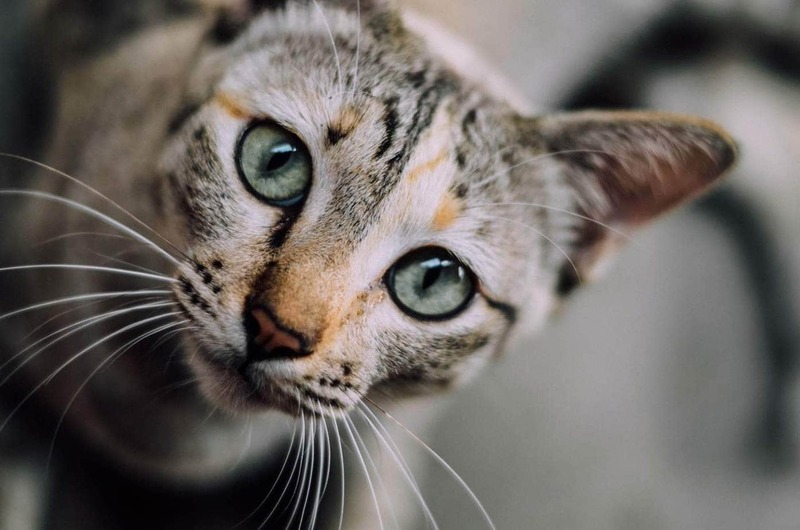 The primary mode of transmission is inoculation via a puncture or scratch from a splinter, thorn or twig, bite or scratch from an infected cat or contamination of an existing wound. Infection can also occur via direct contact with an infected animal, mostly cats. Progressively enlarging, non-healing noduloulcerative lesion (sporotrichotic chancre). Lesions may appear as papules, papulopustules, nodules, or verrucous plaques. They may initially appear as wounds or abscesses. Exudate from lesions is thick and brownish red. 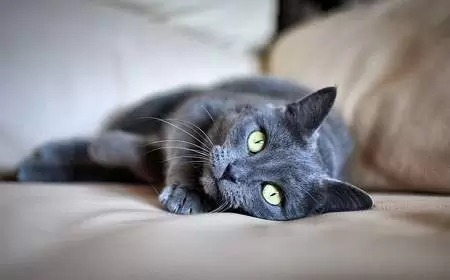 The head, face-especially across the bridge of the nose-and ear margins, as well as the limbs and base of the tail, are the most common areas of infection. Secondary bacterial infection can develop in affected lesions. Swollen lymph nodes adjacent to the affected area(s). Symptoms of disseminated sporotrichosis depend on the body part affected but can include loss of appetite, weight loss, fever, lethargy and widespread cutaneous lesions which spread through the blood vessels. Approximately 1 in 3 cats develop respiratory signs. Lethargy, cough, fever, shortness of breath (pulmonary sporotrichosis). The veterinarian will perform a complete physical examination of the cat and obtain a history from you. Cytology and histopathology: A preliminary diagnosis can be made by microscopic examination samples of from aspiration of abscesses and nodules, ulcerated skin and skin samples which are dried and stained. Fungal culture: Definitive diagnosis is made by isolation of Sporothrix schenckii from specimen culture of a lesion or nodule. FIV and FeLV test: In cats with disseminated sporotrichosis. The treatment of choice for sporotrichosis is oral Itraconazole (10 mg/kg/day), administered twice a day with food. It can take several weeks or months for lesions to resolve. Other treatment options include ketoconazole, sodium iodide, potassium iodide and terbinafine (Lamisil). However, these medications are potentially toxic to the liver. During treatment, it will be necessary to closely monitor liver function for signs of toxicity. Antibiotics if a secondary bacterial infection is present. Due to its zoonotic risk, it is vital for caregivers to practice strict hygiene. 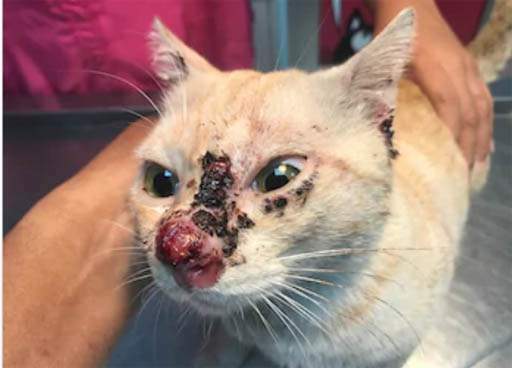 Always wear disposable rubber gloves when handling a cat with sporotrichosis and see a doctor immediately if you develop nodules or lesions. The most effective way to prevent sporotrichosis is to keep cats indoors and desex all cats to reduce the risk of territorial fighting. Sporothrix schenckii is susceptible to the following disinfectants: 1% sodium hypochlorite and iodine. Can sporotrichosis go away on its own? No, sporotrichosis will not go away on its own. 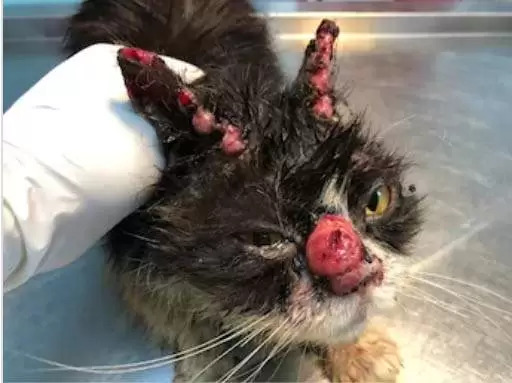 Also, while the cat is infected, carers are at risk of acquiring infection, and there is a potential for disseminated sporotrichosis to develop in untreated cats. Can I catch sporotrichosis from my cat? Yes, infection is possible via exposure to draining lesions or scratches from an infected cat.